Bathrooms are some of the most frequently used rooms in your home, but they can also suffer from cramped quarters. There are a number of interior design tricks and bathroom accessories to help make this space feel larger, and one tip is to use your windows to your advantage to improve your sight lines, according to Better Homes and Gardens. Whether you already have a window in your space or not, adding one can greatly improve the look and feel of the bathroom. Being able to look out onto the landscape when entering will increase the depth of the room and play a visual trick on the eyes that will make it feel much larger. Additionally, you should eschew heavy shower curtains or large glass doors by using a simple pane of frosted glass around your shower area. 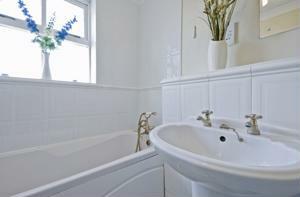 This will allow a greater dispersal of light throughout the bathroom and make it feel far more inviting. The use of natural light can make or break the atmosphere in your bathroom, so make it a primary consideration of your design project. What is your favorite strategy to allow light to filter into your bathroom?